Written and produced by the Invisible Men (Iggy Azalea, Rita Ora, Jessie J), the song first surfaced from a leak on Friday, in advance of a unique official debut by Spears. The singer officially debuted the track over the weekend in a promotion involving Uber. Fans were able to request a "Bee" branded Uber SUV and preview the song as many times as they wanted before their ride ended, making the singer the first artist to use Uber to release a single. 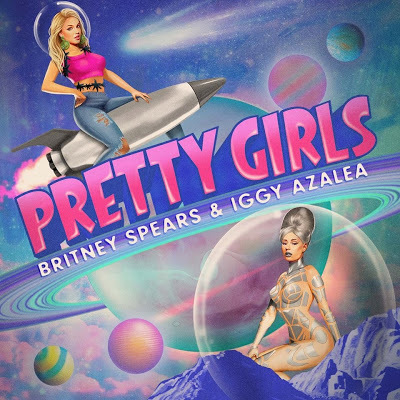 Britney and Iggy will deliver the debut television performance of “Pretty Girls” at the 2015 Billboard Music Awards on May 17. Last week, Spears injured an ankle in a fall during a performance of her Las Vegas residency show, “Britney: Piece of Me.” The singer was forced to postpone her May 1 and 2 concerts under doctor’s orders to allow time for the injury to heal. The singer continues her ongoing residency at Planet Hollywood Resort & Casino.